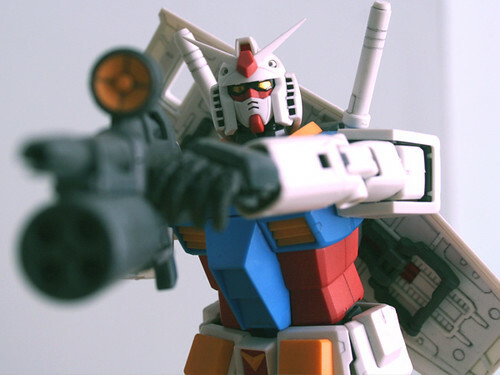 Tubbygaijin.com » MG RX-78 Gundam V 2.0… Ikimasu! MG RX-78 Gundam V 2.0… Ikimasu! He’s done! Well actually he’s been done for some time but between sorting the wedding, the insane business of work and having to travel to Cornwall for a funeral, I’ve been a bit on the busy side! I must say posability is excellent but sometimes when positioning it feels like a bit of stability was compromised, for example the arms tend to come off just below the shoulder, and the feet tend to go walkies too.. I’ve held off putting decals on this guy for now, might do in the future but for now i’m happy with the clean look. All in all it’s a fantastic kit and i’d highly recommend it, need to build Zaku-Kun now so he has some company!